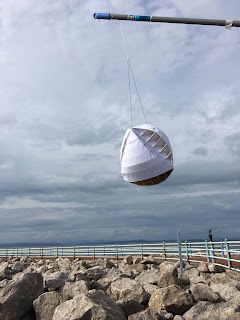 Winner of the UK James Dyson Award, which recognises excellence in innovative designs and engineering, the O-Wind (o for omnidirectional) Turbine captures any random breeze or gale from all vectors and could prove especially revolutionary in dense urban environments where traditional windmills could not go. Small enough to be used by individual apartment dwellers dangling them outside on their balconies, the prototype taps into a power source that previously went unharvested. See a video demonstration and learn more about the awards competition at Dezeen at the link above.